This could represent a model of a turbine blade with internal cooling. Figure 17.6 shows the configuration. 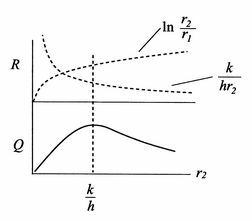 Equation (17.21) is the thermal resistance for a solid wall with convection heat transfer on each side. Equation (17.23) provides some basic design guidelines. The goal is to have a low value of . This means should be large, should be large (but we may not have much flexibility in choice of material) and should be small. One way to achieve the first of these is to have low (for example, to flow cooling air out as in Figure 17.1 to shield the surface). A second example of combined conduction and convection is given by a cylinder exposed to a flowing fluid. The geometry is shown in Figure 17.7. Use of the boundary condition yields . The units in Equation (17.26) are W/m-s. If is less than this, we can add insulation and increase heat loss. 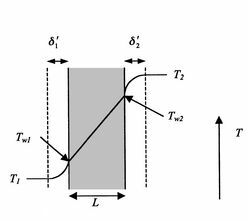 To understand why this occurs, consider Figure 17.8, which shows a schematic of the thermal resistance and the heat transfer. As increases from a value less than , two effects take place. First, the thickness of the insulation increases, tending to drop the heat transfer because the temperature gradient decreases. Secondly, the area of the outside surface of the insulation increases, tending to increase the heat transfer. The second of these is (loosely) associated with the term, the first with the term. There are thus two competing effects which combine to give a maximum at .